Today I have a special polish, well, special for me anyway. 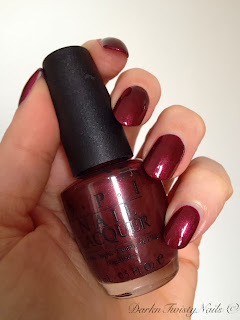 When I was ordering Vodka&Caviar after hunting it down for quite some time, I saw the seller had a few other OPI polishes for sale (it was a private seller). She didn't have any pictures of the polishes, but as soon as I saw this name, I felt all nostalgic and just had to have it! I didn't care what color it was, I wanted it just for its name. When I was 18 I went to Australia for a year and backpacked around the country, like so many young people do. It was a once in a lifetime experience and I still consider that year as the year I grew up and really got to know myself. I loved it and feel a special connection to Australia. So of course OPI Suzi loves Sydney had to be in my stash! When the package arrived, I was extremely happy to see this color. It's a deep maroon red with a gorgeous subtle shimmer. A perfect color for me! It applied perfectly smooth, dried fast and was opaque in 2 thin coats. I am over the moon with this polish. Every time I wear this on my nails, I'm instantly transported back to such a happy moment in my life. But even if you don't have a connection to Australia or Sydney, this is a gorgeous color. This polish was part of the 2007 Australia collection and it's now longer available in store, but you can get it on eBay or Amazon. 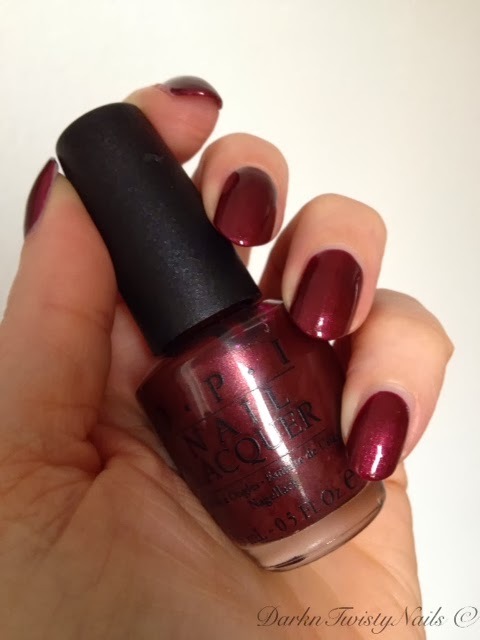 I would definitely recommend checking it out if you love vampy colors, because it's stunning. I can't be the only one who has bought a polish just for its name, because it reminds you of a special place, occassion or person and I would love to hear what polish you bought for this reason! 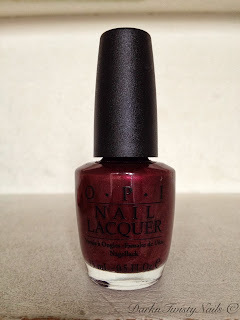 Red is my ultime favorite polish color, vampy, deep, maroon, bright, neon... I love them all! I would definitely recommend this polish, it's gorgeous! You really lucked out! This color is so you!! It looks beautiful Anca! I know! I couldn't believe it when I saw the bottle! Oh so pretty! It looks like it has that shimmery finish like I'm Not Really a Waitress! Gorgeous!! I don't own Waitress, but I do own An Affair (they are pretty close) and you're right, it is the same gorgeous shimmer! What a great colour and an even better memory!